Mgosoft PDF Text Converter is a fast, affordable way to batch extracting text from PDF file to plain text files, and also provides the conversion of plain text files to Adobe PDF files. It converts old txt, text, textual report to nice PDF file (form, invoice, report, sale sheet) on all Windows Systems. This tool is indeed helpful for creating full-text searchable archive database. This tool is independent of any PDF reader software. 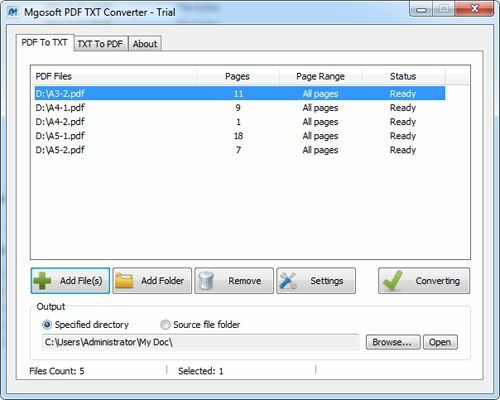 Convert PDF to plain text in batches. Support PDF format version 1.8. Extract hidden image alternative text from PDF. Automatically align text columns in tables. Retain original page layout of PDF.